Weren’t they also in that other movie? Gordon MacRea and Doris Day appeared together in six films, though one of them — So You Want a Television Set (1953) — a ten-minute one-reeler, uses them only in a tongue-in-cheek cameo. Starlift (1951) also showcases their talents briefly among a cavalcade of other performers. 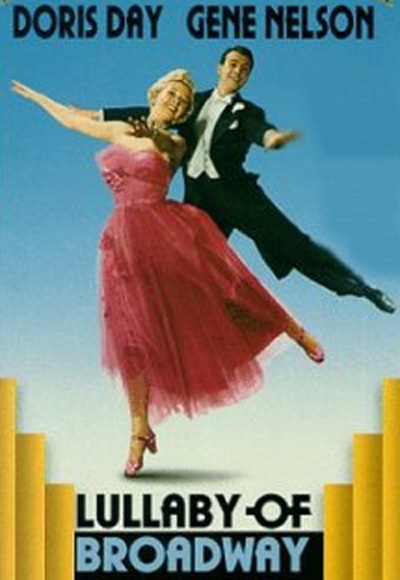 But in Tea for Two (1950), The West Point Story (1950), On Moonlight Bay (1951), and By the Light of the Silvery Moon (1953), they enjoy a great deal of the spotlight as they croon and dance and romance in the charming, albeit typical, hollywood fare of boy meets girl, boy loses girl, boy gets girl back. Gene Nelson may be considered a third in this duo, for he appears with Doris and Gordon in Tea for Two and The West Point Story. He also teamed with glamorous Doris in Lullaby of Broadway (1951) and partnered with cowboy Gordon in Oklahoma (1955). They were SO good together! They both had GREAT voices, and their voices were really good together! I LOVE EVERY movie I’ve seen with them in it! is there an album of their songs together? i’d like to own it. 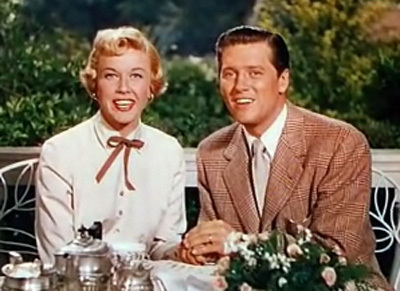 In a further reply to Kevin, the reason for there not being any Doris Day duets on disc with Gordon MacRae is because of contractual limitations imposed at the time, Doris was contracted to Columbia and Gordon to Capitol Records. It simply wasn’t allowed as I understand it. Great shame I agree. For more in-depth information about Gordon MacRae and Doris Day, you might consider finding a copy of Bruce Leiby’s Gordon MacRae: A Bio-Bibliography (Bio-Bibliographies in the Performing Arts) and/or a copy of A.E. Hotchner’s Doris Day: Her Own Story. An alternative (indeed, preferable in my view) to reading about them is to push play on the media device of your choice (e.g. DVD), nestle up with a loved one on the couch, and watch, as a regular member of an undying and loyal viewing public, their multifaceted displays of craft. Doris Day’s activism in support of humanely treating animals has long been a passion of hers and continues to this day (she celebrated her 95th birthday on April 3rd of this year). Gordon MacRae also developed a passion for helping. For many years he suffered alcoholism and overcame it in his 50s. Soon after and for the rest of his life, he donated his time and energy to helping others with addiction. He died in 1986 at the age of 64 from complications from cancer. John Wayne & Harry Carey, Sr.